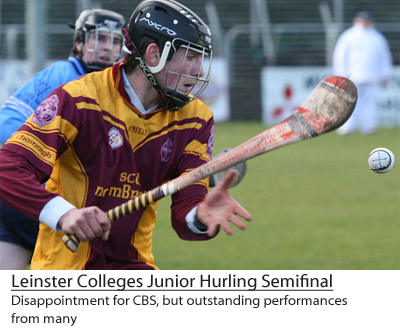 The semi final of the Leinster Colleges Junior Hurling Championship between CBS Kilkenny and Good Counsel, New Ross, was played at 3pm in Thomastown on Monday October 15th. Having conceded a soft goal in the first half, CBS was down ten points at half time. But in the second half the team rallied with outstanding performances from many, preventing any further scores from Good Counsel. Disappointingly it was not enough, with a final score of 1-11 to 0-11.